The most comprehensive and up-to-date survey of five industrially important areas ofcatalysis, Catalysis and Surface Science focuses on chemicals from methanol … hydrotreatingof hydrocarbons . . . catalyst preparation … monomers and polymers … andphotocatalysis and photovoltaics.In each of these significant topics, this useful collection of articles traces state-of-the-artdevelopments in fundamental science … in current exploratory and applied research …and in current technology. It outlines future trends in catalytic research and technology,and gathers together and synthesizes-into one, single, handy reference-the informationcontained in voluminous, widely scattered articles, books, and patents. 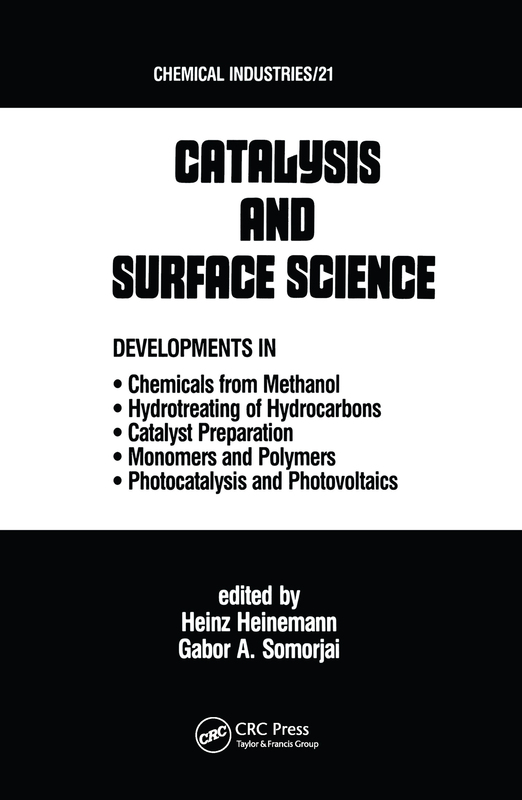 As added referencefeatures, this authoritative source provides a wealth of illustrations, including photographs,charts, tables, and line drawings .. . plus useful, detailed bibliographies for further research.Written by 32 leading authorities on all aspects of catalysis, Catalysis and Surface Scienceis essential reading for chemical, industrial process, petrochemical, and electronicengineers, as well as industrial, polymer, and materials chemists. It is also a useful text forgraduate students in chemistry and chemical engineering.